This wasn't a book I would have decided to randomly pick up off my book shelf and just start reading but because the price had dramatically dropped a little ago on Amazon, I wasted no time scooping it up. I wasn't sure about it but it turns out that I really enjoyed reading it. And I was left wondering why I thought I never would. Both The Silurians and The Sea Devils are amongst the best loved adventures from the Jon Pertwee era of the show, if not the entire the show. The idea of if they are actually villains is always ambiguous and that is a big part of their appeal. As they refer to themselves throughout this novel, The Earth Reptiles are neither good or bad, there are those who believe that an alliance with the human race is the only way forward. But there are those who only believe in the extermination of the apes who have overrun their planet. And it is this conflict which is thrown away in their stories, either on television, print or audio. Their ambiguity is what makes them interesting. Set not long after the events of the television serial, Inferno and the novel, Eye of the Giant, The Scales of Injustice, sees the Silurians returning once again to cause trouble around England. A handful of people go missing and the Doctor and UNIT get themselves involved to find the source of the disappearances. When it quickly becomes apparent who is behind the vanishings, the Doctor tries again to make peace between the Silurians and the humans. The Scales of Injustice goes a long way to fix some supposed continuity issues that would later pop up in the Fifth Doctor story, Warriors of the Deep. The main problem is that the Fifth Doctor knew who the Silurians and Sea Devil's were called in Warriors, despite us never having had that particular adventure. 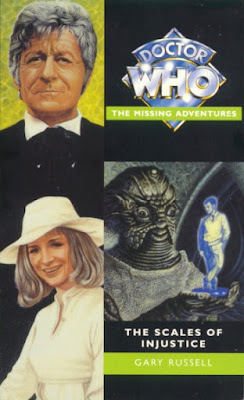 This novel makes sure that some of the Silurians and Sea Devils are those in Warriors, fixing the continuity issues which would hit the first story of Peter Davison's final series hard. Writer, Gary Russell does some excellent work with the series' main characters. He seems to have a perfect grasp of who each character is. Not only the main characters but the new characters that he created specifically for this novel. Amongst his characters are an interesting bunch of villains who I won't go into for spoiler reasons and the Brigadier's secretary, Masie Hawke, who comes across as a strong, intelligent woman, who is written so brilliantly that it feels like we've known her all along. And although her character comes in unnamed in Day of the Daleks, this feels like her proper creation. Both she and the aforementioned villains are so well written that you will be left wanting more! But the best parts of this novel are those which concern Liz Shaw and the Brigadier's personal life. When it comes to Liz's part in the book we learn more about what is going on in her head, especially the circumstances which lead to her leaving the Doctor and UNIT. Russell remains loyal to her character as we saw her on television, while adding just enough to make her an even more enjoyable character. It will make you wish that there had been more stories with her as the companion on the television. With the Brigadier, Russell gives us a lot about his personal life. We get to read about him interacting with his wife and daughter. His marriage is falling apart as a result of the strange hours he has to keep at UNIT. It is a common story of a lot of working men, whose focus is in the wrong place, but it is made even more poignant because it is about a character that many fans of the show have a huge affection of.